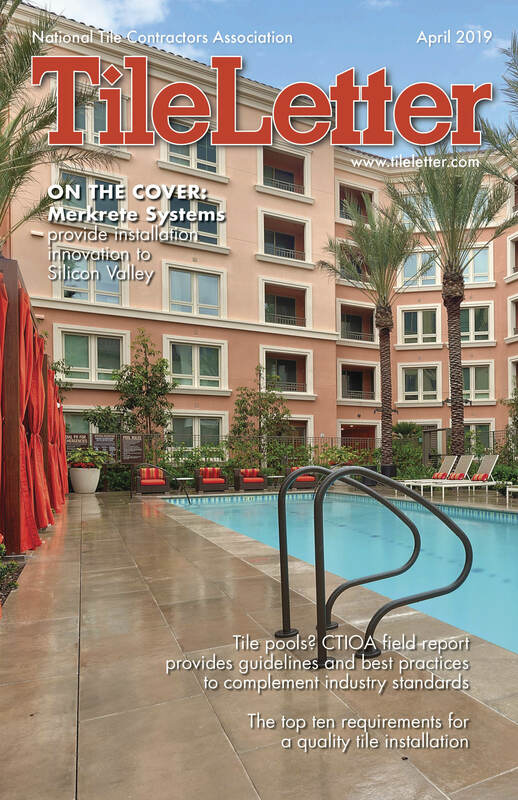 When an owner of a newly built home in Berkeley, Calif., contacted Martin Brookes of NTCA Five-Star Contractor Heritage Marble & Tile in Mill Valley, Calif., about cladding his home’s exterior, Brookes knew the project was going to take technical expertise and special installation protocols, setting materials and specialized equipment. The finished project involved 3,200 sq. ft. of large-format porcelain tile for cladding, upper deck and out buildings. The Raimondi RAI-FIX Anchoring system provided a simple, effective solution to prevent the fall of the tiles applied vertically with adhesive in case of detachment from the wall. knew this would be a challenging project and layout would be critical due to the owner requiring full tile on all four sides,” Brookes explained. “We teamed up with LATICRETE, which gave an installation procedure we were comfortable in executing.” Dale Foster, LATICRETE rep, was a huge help in helping things run on time without a hitch. Though these were large-format tiles, they were thick and rigid at 1/2″ (12.7 mm) – not the thin gauged porcelain tile panels (GPTP) becoming increasingly more popular today. “Because of the weight of the tile we also decided to anchor the tile with Raimondi RAI-FIX Anchoring System,” Brookes added. 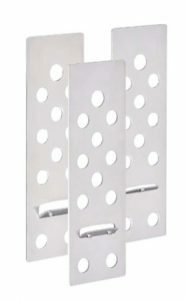 This system provides a simple, effective solution to prevent the fall of the tiles applied vertically with adhesive in case of detachment from the wall. At the time – the project spanned February – May 2017 – Raimondi RAI-FIX was not available in the U.S., so Heritage had the components shipped from the UK to meet the schedule for the installation (Note: the system is now available domestically through Donnelly Distribution at donnellydist.com). 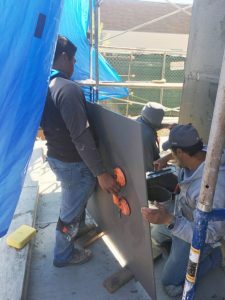 In addition to the installation protocol, anchors, and setting materials, what helped the job to go smoothly was the excellence and expertise of crew members Gabriel Cortez and Leo Escamilia, who are both Certified Tile Installers and ACT Certified. They corrected the previously installed substrate to provide a suitable surface to be tiled, and layout was thoughtfully calculated to make the finished product shine. Because the panels were so thick and rigid, crews used suction cups to move the tile from the scaffold to the substrate. The project started toward the end of the rainy season, so Heritage crews had to protect the work space. Crews used a large MK Diamond bridge saw on site to cut the material, which worked perfectly, Brookes said. All the corners on the project featured quirk miters. 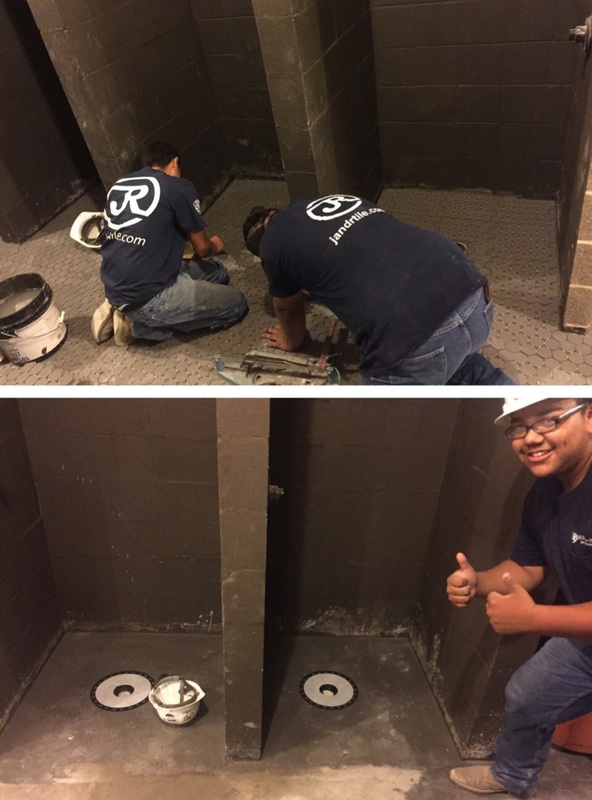 Crews, led by CTI/ACT certified Gabriel Cortez and Leo Escamilia, corrected the previously installed substrate to provide a suitable surface to be tiled, and layout was thoughtfully calculated to make the finished product shine. The contractor had GPTP equipment on hand to move the tile due to its size. But because the panels themselves were so thick and rigid, Brookes didn’t need to use it and opted for suction cups to move the tile from the scaffold to the substrate. It took four crew members to handle the weight and the handling of the tile. Heritage Marble & Tile workers implemented directional troweling with LATICRETE 254, which performed exactly as expected. Leo Escamilia (l.), a valued Heritage crew member who is a CTI and ACT certified, along with LATICRETE rep Dave Foster – both of whom were instrumental to the smoothly running project. The Heritage team – and the client – were thoroughly pleased with the results, which amounted to about 3,200 sq. ft. of tile for the cladding, upper deck and out buildings. “Although this was a challenging project, the guys excelled and the finished product was to the delight of the owner,” Brookes concluded. Built in the late 1950s, Bhojwani Tower was designed by Albert Anis, known for his Art Deco architecture throughout Miami. 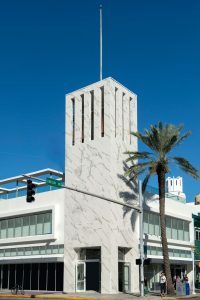 Originally a bank, the Bhojwani, located on the corner of one of Miami Beach’s busiest pedestrian intersections, operates as a mixed-use building with residential and retail areas. 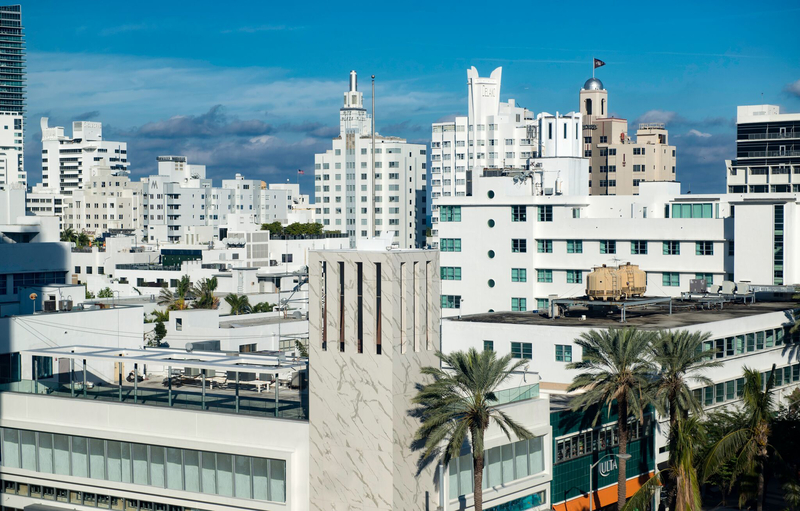 When beginning the renovation process, Kobi Karp Architecture and Interior Design not only had to consider updating the building’s exterior to stringent building codes but also meeting the requirements of the Miami Beach Historic Preservation Board. Dan Slain of HyCOMB with HyCOMB’s unique stone and porcelain cladding solution. Due to hurricanes, South Florida’s coastal areas fall into the High Velocity Hurricane Zone. Miami-Dade identified that it isn’t wind and rain that causes the most damage in strong storms; its exterior building pieces that come loose and turn into projectiles during extreme conditions. 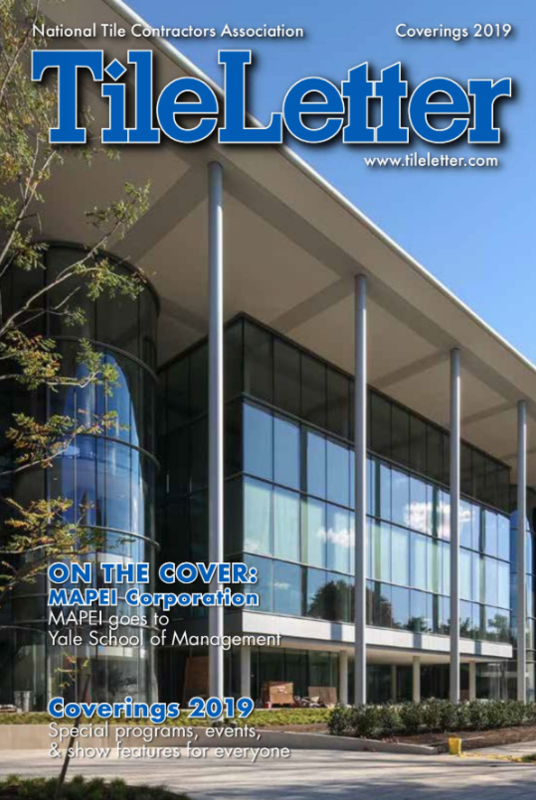 The International Building Code doesn’t allow anything larger than 3 square feet to be attached to the outside of a building because the adhesives used would cure before the cladding pieces are properly placed – especially in the area’s warm climate. This would make cladding more prone to fly off during storms. Prior to installation, precut panels are laid out in the warehouse to ensure a match with adjoining pieces for a more continuous flow. To meet all code and preservation requirements, the Kobi Karp design team specified Crossville’s I Naturali collection of gauged porcelain tile panels to cover the exterior walls of the Bhojwani Tower. The team also advised Miami-Dade County officials that the Crossville material would meet stringent building codes and come in on budget if mounted with HyCOMB USA’s innovative cladding system. Robert Sutnick, Crossville, Inc. A&D representative, and Dan Slain of HyCOMB at HyCOMB offices in Hallandale Beach. 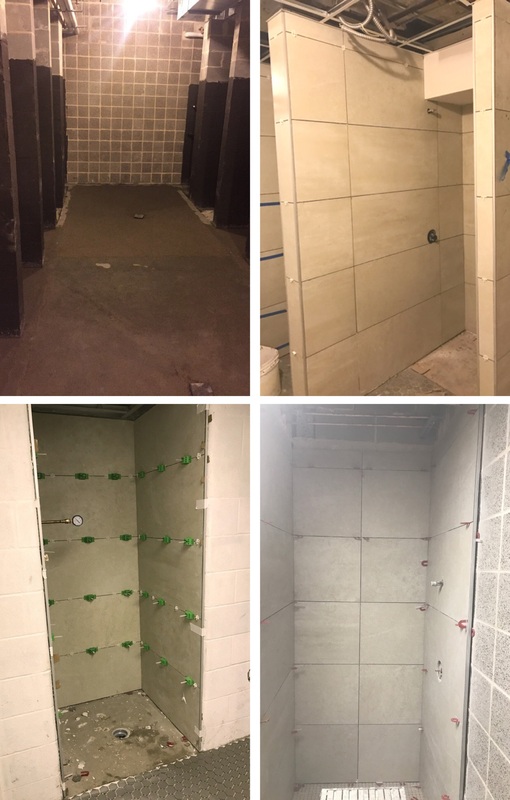 The HyCOMB USA team worked with D&B Tile Distributors – a frequent host of CTEF’s Tile and Stone Workshops – to deliver the solution for installation of Crossville’s gauged porcelain tile panels for this project. 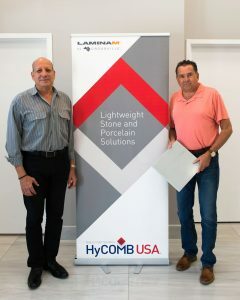 Daniel Slain of HyCOMB USA explained that the company’s system works with Crossville’s surfacing solution because of the unique backing configuration and proven performance during testing for extreme conditions. During testing, a standard piece of 2” x 4” lumber is shot out of an air cannon at a rate of 50 feet per second (fps). That’s over 34 miles per hour. This exercise shows simulated impact from airborne objects in hurricane situations. “We have a honeycomb backer that is .75” thick,” Slain said. “We bond the gauged porcelain tile panels to our core.” After testing, the HyCOMB panels sustained minimal damage from the projectile 2” x 4”s, and remained intact, he said. Crossville’s panels are 1M x 3M and relatively simple to work with for experienced installers who have received training with the material. The bonding of the tile panels to the HyCOMB USA core offers distinct efficiencies unparalleled by other surfacing options. Another major advantage of using the Crossville tile panels is the weight compared to other cladding options. These panels are lightweight enough to be handled by fewer workers. This is important to note for the Bhojwani project because of its location on a busy street corner in the heart of the tourist district. If the architects had specified natural stone, the project team would have faced more time-consuming challenges and safety issues. With the porcelain panels, the three-man crew was able to lift the tiles through the scaffolding and put them in place using HyCOMB’s fastening system – reducing both time and risk factors for the project during installation. 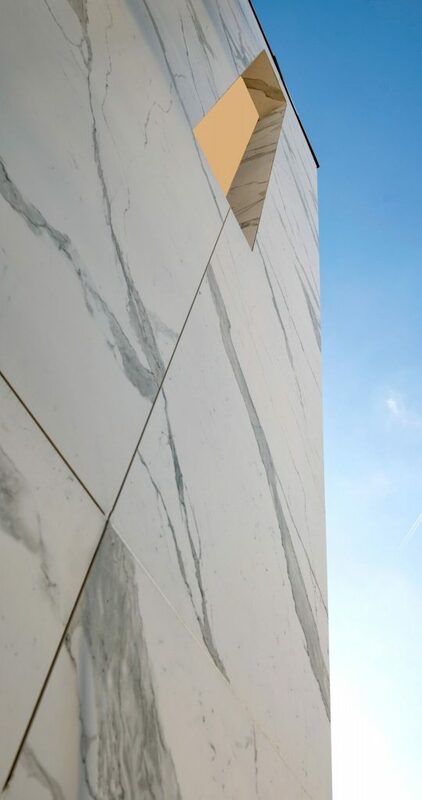 Beyond the benefits of installation efficiencies, the tile panels’ classic, timeless look answers aesthetic demands and is actually more consistent in appearance than other materials such as natural stone. The panels not only offer a beautiful appearance for the building, but they will also be able to withstand the harsh South Florida elements. They’re innately resistant to UV rays and are highly scratch-proof and resistant to deep abrasion. Also, the panels are eco-friendly, as the body of the tiles is comprised of natural raw materials, and the tile does not release toxins into the environment. Right style, right performance, right for the environment – Crossville’s porcelain tile panels are ideal for Miami Beach’s preservation standards and the seasonless appeal of this iconic destination. Bhojwani Tower, with its new Crossville gauged porcelain tile panel exterior, stands out on the skyline of Lincoln Road in Miami Beach. 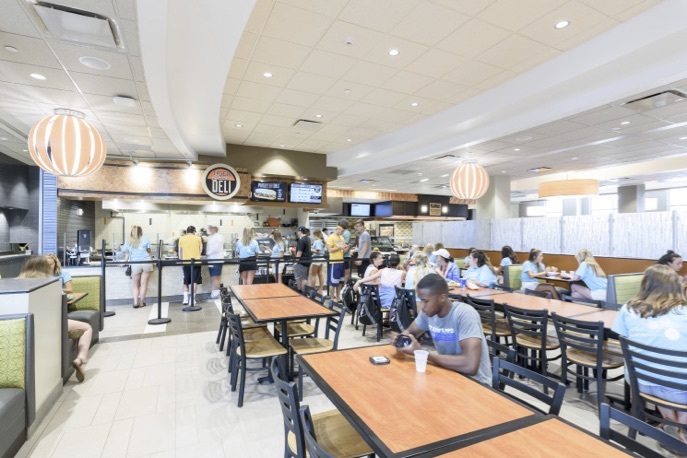 The Restaurants at Southwest, University of Missouri’s (Mizzou or MU) newest dining facility, features a collection of distinct dining venues, each with its own character, arranged to create a variety of dining experiences. 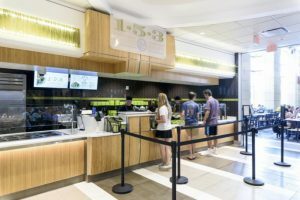 From the soaring, two-story space of the Legacy Grille to the old-world charm of the pasta venue Olive & Oil, the new 600-seat dining center serves as the social hub of the Southwest Neighborhood and can accommodate 2,500-3,000 students living in the nearby residence halls and fraternity and sorority houses. The finish materials selected by the designers on the project – KWK Architects and associate architect Lawrence Group – reinforce the concept menu and character for each venue, and tile was the first choice for the flooring and walls surfaces. “Tile provided a wide range of design possibilities, durability and ease of maintenance unmatched by other materials. 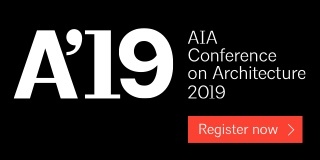 Tile also contributed to the sustainable goals of the project, which is anticipated to achieve a LEED Silver certification,” said Sara Koester, AIA, Principal at KWK Architects. More than 42,000 sq. 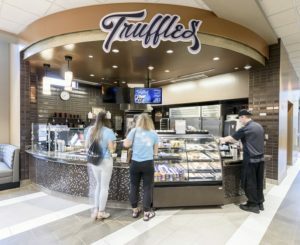 ft. of tile costing an estimated $200,000 were installed at The Restaurants at Southwest, said Project Manager Derek Kutz of tile contractor Richardet Floor Covering, Perryville, Mo. A team of up to 12 installers had just 10 weeks to complete the intricate tile project, which included 20,000 sq. ft. of floor tile; 22,000 sq. ft. of wall tile; 20 different styles of Schluter metal edging; 48 different tile styles; 620 50-lb. bags of mortar; 268 units of epoxy grout and 100 units of grout. The main tile manufacturers used on the project included: Crossville, American Olean, Marazzi USA and Daltile. Floor tile formats included 6” x 6”, 12” x 12”, 12” x 24”, 6” x 24”, 24” x 24” and 6” x 36”. 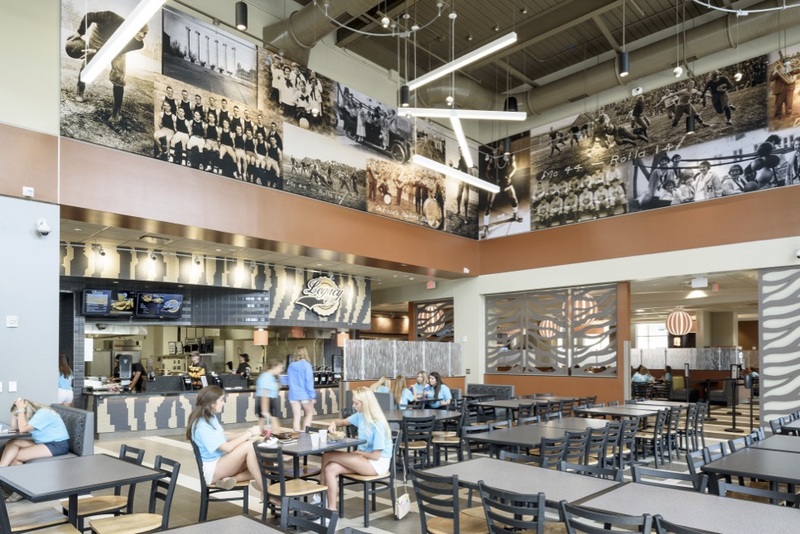 The main venue of the dining facility is the Legacy Grille, which is designed to celebrate the rich heritage of MU sports and is filled with historic photographs in large wall murals, accented with the patterns and colors of the school’s mascot, the tiger. Unglazed ceramic mosaic tile in a multicolored, custom tiger-striped pattern is used on the venue fronts and soffit. Small-size tile (1” x 1”) worked well for creating the curved shapes of the tiger stripes, one of the more challenging tile jobs on the project. 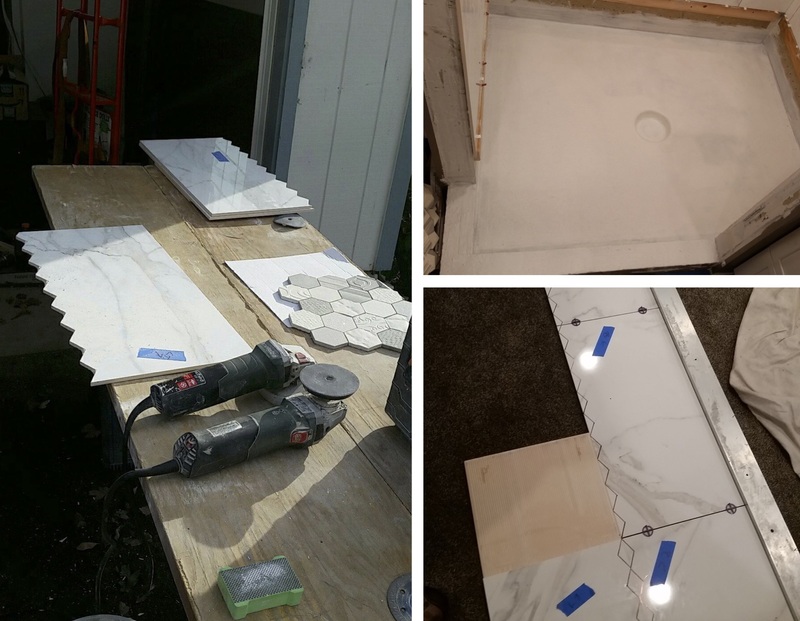 Tile installers spent 10-12 hours cutting the 1’ x 2’ tile sheets into the desired pattern. The complex pattern was laid out on the floor and approved by the architect prior to being pieced together on the wall during installation. 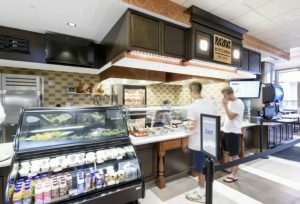 The Tiger Avenue Deli has an urban feel and features hot deli sandwiches fresh off the grill. Bright orange tiles pop across the back wall to animate the venue and add to the “sizzle” feel. The home-cooking station, 1839 Kitchen, has a traditional look with raised wood cabinets, copper accents and “marble” counters. A two-colored, two-sized tile pattern was used to animate the back wall and add to the residential character. 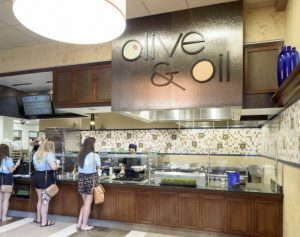 Olive & Oil, a Mediterranean and pasta concept, features hand-painted, decorative tiles and painted plaster walls for an “old-world” feel. The dessert venue, Truffles, has a rich palette of glass tiles in golds and purples and chocolate- and caramel-colored walls and ceilings. material throughout the dining areas in multi-colored, multi-sized patterns, with each seating area having its own, well-defined pattern and circulation area. Tile offered the durability needed for this type of facility, as well as the ease of maintenance. Porcelain tile with the appeal of concrete and cut stone was used in all seating areas except Olive & Oil, where wood-look tile was used to add warmth to the space. Quarry tile was used for the rest of the venues’ flooring and food production kitchens. Tile contributed to several of the sustainability goals on the project as well, as many of the tiles were made from recycled materials and green-squared certified. Kutz said one of the greatest challenges on the project was meeting the tight deadline and coordinating the tile installation around the subcontractors working in the same spaces. Open communications and scheduling among all subcontractors were the key to keeping the project on track, said Kutz. The tile installers worked a minimum of 12 hours a day, and a couple of Saturdays, to complete the project on schedule. 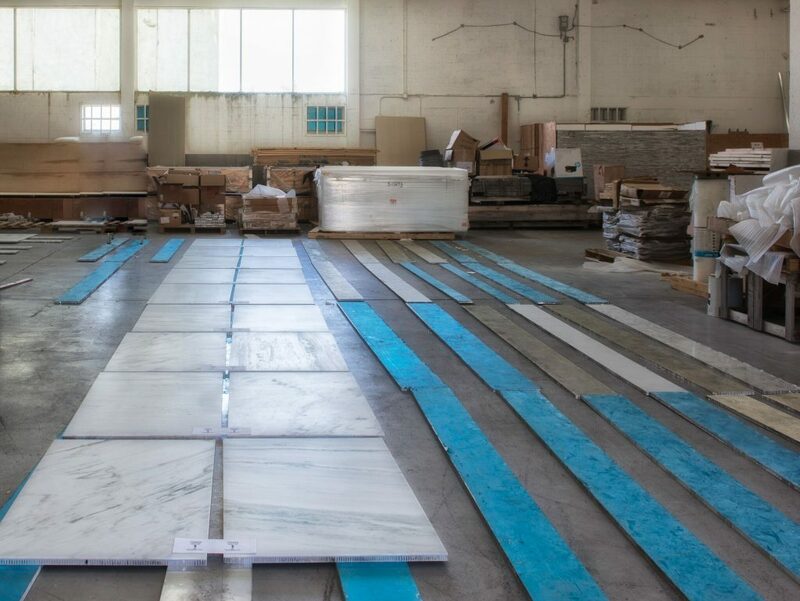 For our Large-Format Tile section this month, we take a look at three individual jobs that utilized large-format tile, and we explore the procedure and materials needed to achieve a quality, high-performance, long-lasting job. All contractors are NTCA Members, and all either are themselves Certified Tile Installers, or employ them in their crews. This 1,500-sq.-ft. job by Charles Nolen for Carpet Corner of Indiana utilized 30” x 30” large-format porcelain tile from Atlas Concorde’s Brave line at the Lilly Company in downtown Indianapolis. 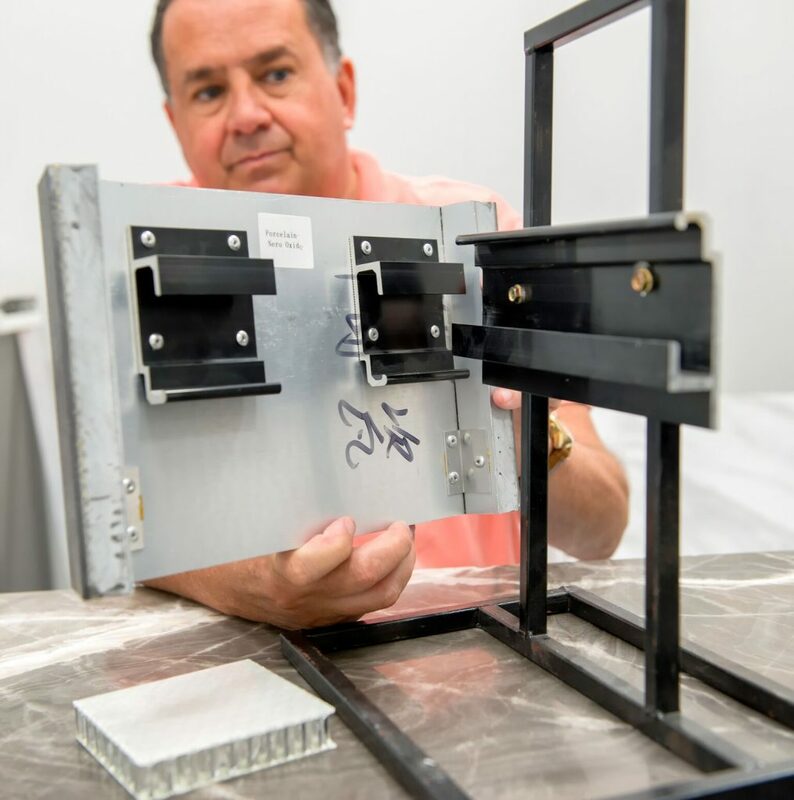 The crew – Nolen, along with his son Caleb Nolen and Reece Stepler – used expansion foam around the perimeter of the room, and applied three coats of a topical crack-isolation membrane. Only then were the 30” x 30” tiles installed with a multi-use, polymer-fortified adhesive mortar to “achieve a flawless tile assembly that will stand the test of time,” Nolen said. 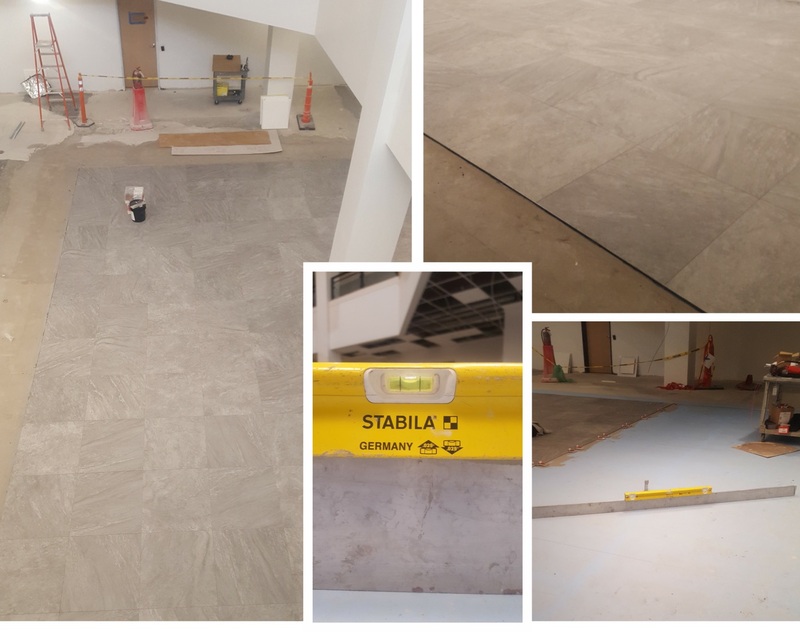 “We are especially proud” of this design build at Trinity University that features Florida Tile Level 10 HDP-High Definition Porcelain 18” x 36” in Pearl Atrium installed with a 1/8” joint, said Eric Albrecht, M.Ed., of J&R Tile. The project was a total $8 million renovation. 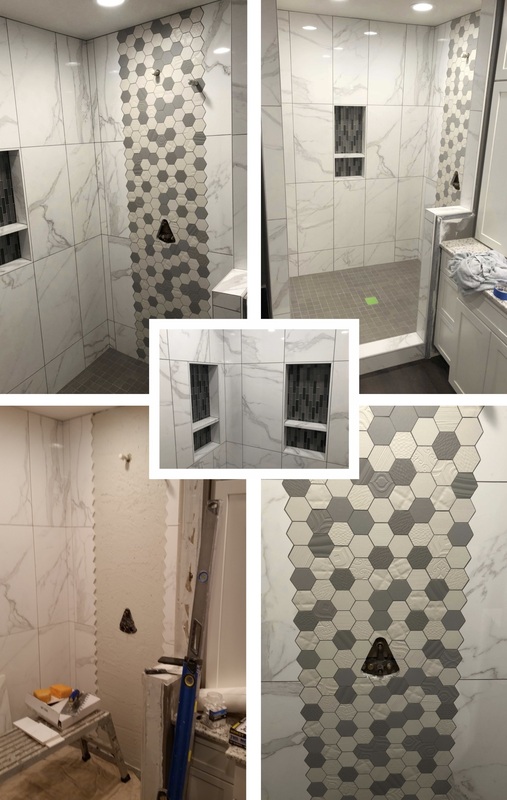 J&R saved the client “loads of money on an epoxy grout spec, and the [originally] speced tile was thicker, smaller and more expensive,” she added. 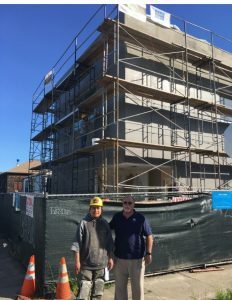 J&R’s Adam Arrellano, who holds CTI and Advanced Certifications for Tile Installers credentials, was the working foreman on this project and also was responsible for the layout and design. He centered and balanced the tile with no less than 1/2” the cut per industry standards. Tile was installed with large-format tile adhesive and two-component 100% solids epoxy grout on a 1/8” joint. J&R utilized a lippage tuning system to achieve desired lippage tolerances. 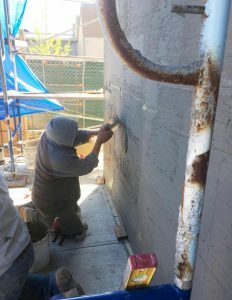 The cinderblock substrate was waterproofed with two coats of liquid-applied waterproof over concrete masonry units (CMU). J&R used deck mud and custom floating for positive drainage to over 20 integrated bonding flanges to achieve point drainage. Florida Tile’s 2” x 2” mosaic hex was also installed on floors, and extruded aluminum profiles were chosen as an elegant cost-saving solution instead of bullnose and sanitary cove. The tile is 14”x 28” ceramic from Love Ceramics. “Big tiles mean perfect prep,” he said. This included lightweight, extruded polystyrene core waterproof board walls that were wet-shimmed with high-performance, rapid-set, rapid-dry mortar with extended open time and build characteristics, which allowed the crew to run screws and sealant after lunch. The curb is built from 2” x 4” x 8” concrete block with the same mortar, and the top has a mortar screed so the topical waterproofing is pitched in. The pan is a divot float of floor mud waterproofed with rapid waterproofing/crack-isolation liquid membrane and mesh reinforcement. Tile is set in lightweight, non-sag mortar designed to accommodate large-and-heavy tile, and grouted using specialized cement grout, with silicone caulk at all changes of plane. Davis noted that all straight cuts were made on a Montolit Masterpiuma 93p3, and edges broken with a diamond hand pad. The L-cuts around the niche and the miters on the curb were made on a wet saw. Hex scribe layout is full tile at the ceiling. While marking it, Davis checked the distance between points to ensure the pattern wasn’t drifting. Cuts were done with a Metabo grinder and a respirator, edges eased on a variable speed. “I cut the scribes in full tiles and then ripped them on the cutting board, and you’d better believe I held my breath while I made those scratch cuts,” he said. Trims were fabricated on a 10” chop saw with a non-ferrous metal cutting blade. 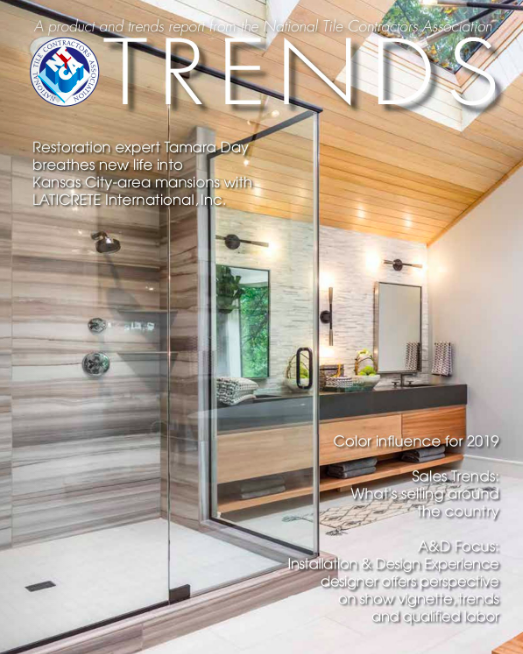 Erick Hendricks handled all the trim work, including the niches.“The shelves in the niche are what we’ve taken to calling the ‘miter sandwich’ – three mitered pieces fabbed from one piece of field tile so the grain wraps,” he said. 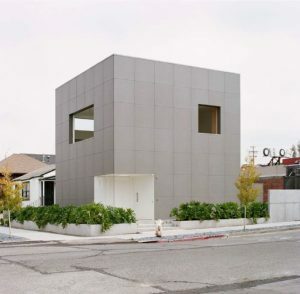 The right hand niche in the project is in an exterior wall, so Davis hung 2” polystyrene waterproof backer board walls on the sub-siding as a thermal break. The entire installation took Davis and Hendricks five and a half crew days.